Size: Up to 9 feet, usually about 3 or 4 feet. Growth Form: Shrub; trunk up to 1 foot and 2 to 4 inches in diameter, joints 2 to 6 inches long, plants sparsely to densely branched. Flower Color: Bright yellow to bronze to brick red, anthers yellow. Flowering Season: May and June. Elevation: 1,000 to 3,000 feet. Habitat Preferences: Sandy, gravelly washes in the desert. 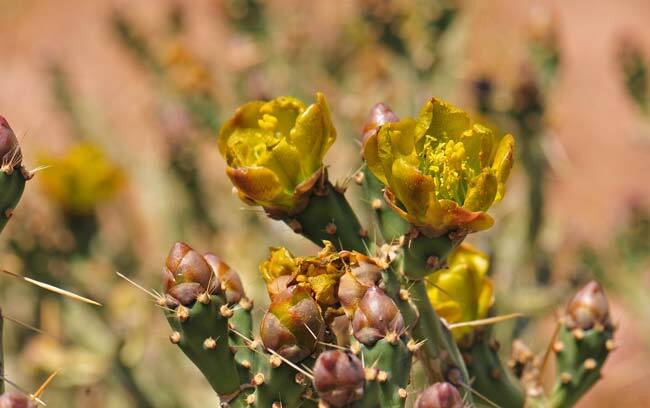 Recorded Range: In the United States, Arizona Pencil Cholla is found only in the state of Arizona, where it is found in the central and southern parts of the state. 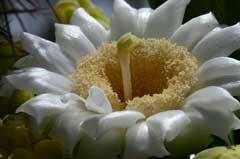 It is also native to central and northwest Mexico. North America & US County Distribution Map for Cylindropuntia arbuscula. 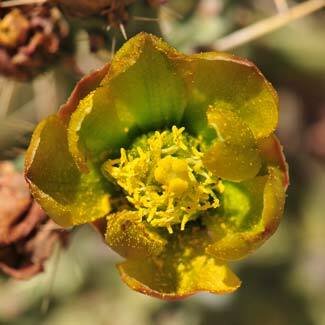 Threatened/Endangered Information: Opuntia arbuscula, Pencil Cholla is salvage restricted in Arizona. 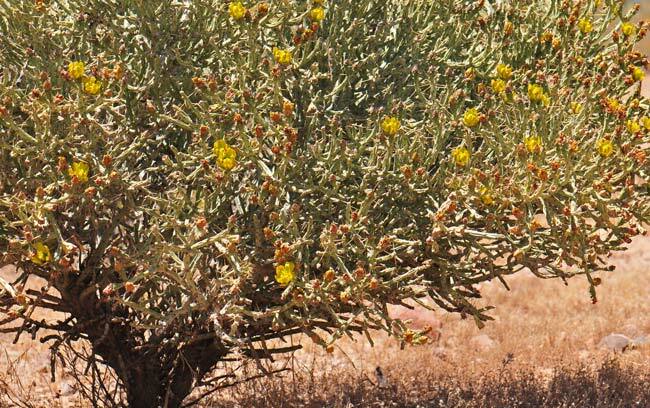 Comments: Arizona Pencil Cholla, Cylindropuntia arbuscula is in a group of cacti sometimes referred to as "pencil chollas" and is similar to, and closely related to Christmas Cholla, Cylindropuntia leptocaulis and to Klein's Pencil Cactus, Cylindropuntia kleiniae. The type specimen for Cylindropuntia arbuscula is from Pinal County, Arizona. In Southwest Desert Flora also see: Buckhorn Cholla, Cylindropuntia acanthocarpa, Teddy Bear Cholla, Cylindropuntia bigelovii, Jumping Cholla, Cylindropuntia fulgida, Gander's Buckhorn Cholla, Cylindropuntia ganderi, Klein's Pencil Cactus, Cylindropuntia kleiniae Christmas Cactus, Cylindropuntia leptocaulis Walkingstick Cactus, Cylindropuntia spinosior and Baja Pencil Cholla, Cylindropuntia tesajo. 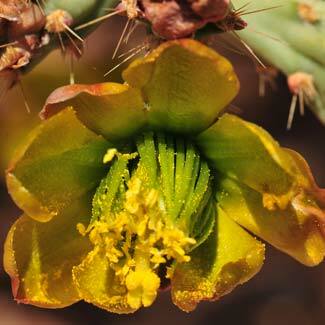 Arizona Pencil Cholla provided food for southwestern American indigenous peoples. Pima Food, Fruit; Green fruits boiled with saltbush and used for food. Pima, Gila River Food, Dried Food; Calyxes pit roasted with inkweed and dried for future use. Pima, Gila River Food, Unspecified; Calyxes pit roasted with inkweed and eaten fresh. Pima, Gila River Food, Unspecified; Flowers pit roasted and eaten. See other ethno-botanical uses at Native American Ethnobotany, University of Michigan, Dearborn, Michigan. 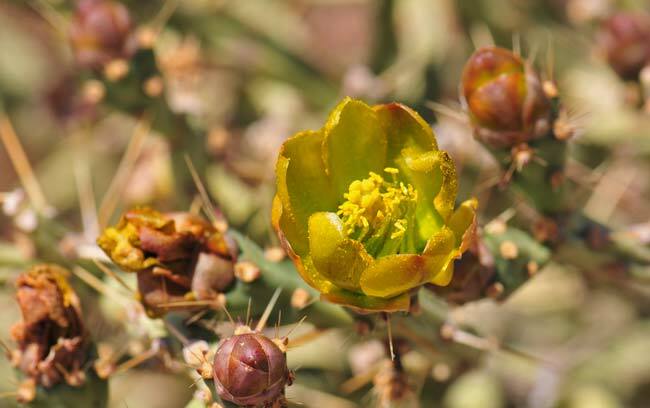 Arizona Flora, Kearney, Thomas H., Peebles, Robert H., 1960, University of California Press, Berkley and Los Angeles, California, as Opuntia arbuscula. Donald J. Pinkava, FNA | Family List | FNA Vol. 4 | Cactaceae| 104, 107, 110, 111 | Cylindropuntia | Flora of North America Editorial Committee, eds. 1993+. Flora of North America North of Mexico. 16+ vols. New York and Oxford. (accessed 07-Jun-2015).